The best way to spend a Sunday afternoon? (Apart from on a beach somewhere of course), brunching with my loved ones. If you follow me on social media you'll know I'm pretty obsessed with brunch. Brunch is my thing and slowly but surely, the North are starting to understand brunch. First, I visited Gaucho for their Electro Brunch and then, this month, I decided to try brunch at one of my other favourite hideouts, Pintura. I know my last post was a foodie post so I promise after this one, we'll have a beauty or travel post but it's Sunday, I couldn't not share this. If you missed my first blog post all about Pintura, make sure you read my Pintura review! authentic basque food served in a dreamy setting - unfortunately, way too dark even for my new camera so apologies in advance that these photos aren't my best. It's romantic and lovely but not the best for those Insta worthy shots (sorry guys and gals), you've just gotta put down your phone and enjoy (as hard as this is for me haha). Pintura specialises in gin, but on a Sunday afternoon, we decided to stick to the fresca juices because we had some gin at home ready to tuck into! 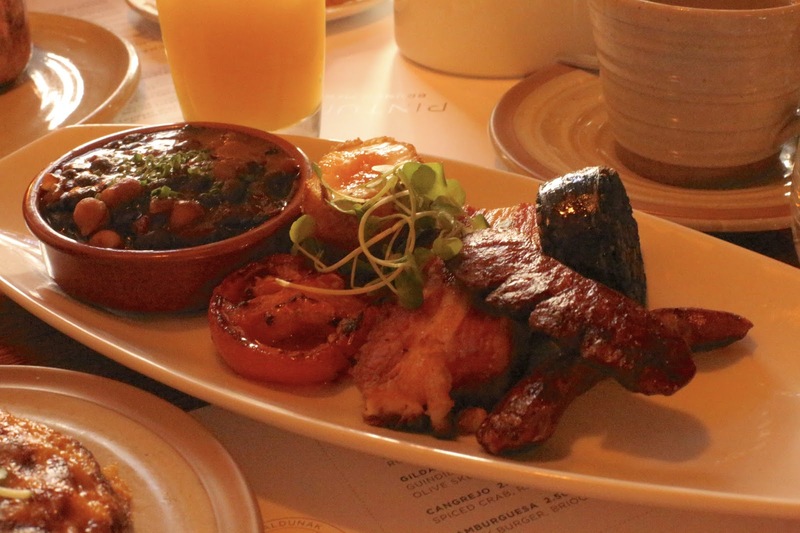 We chose a number of dishes from the menu, unfortunately, unlike Gaucho they don't come unlimited but you do get a free coffee or juice with a brunch dish. There are loads to choose from and because we were mega hungry (one dish isn't enough) we went for a few. 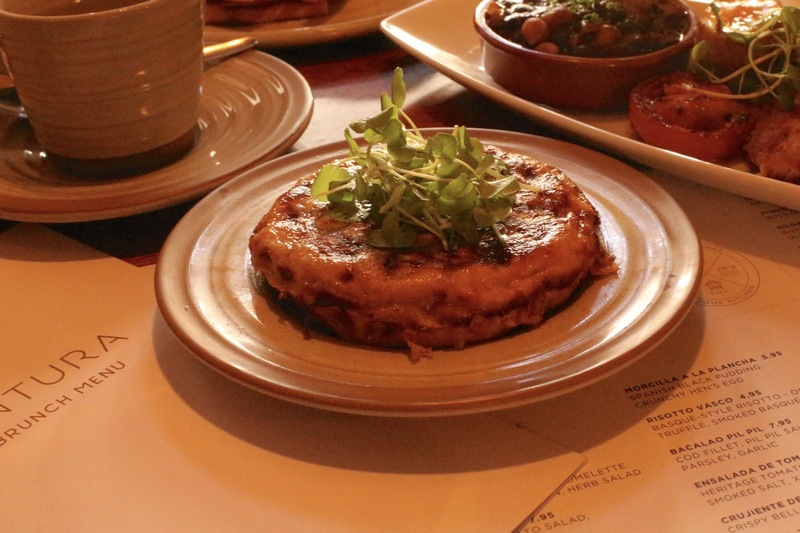 This isn't a bottomless brunch, it's more that they just do a brunch menu on a weekend but it's definitely worth checking out if you fancy something delicious and different. 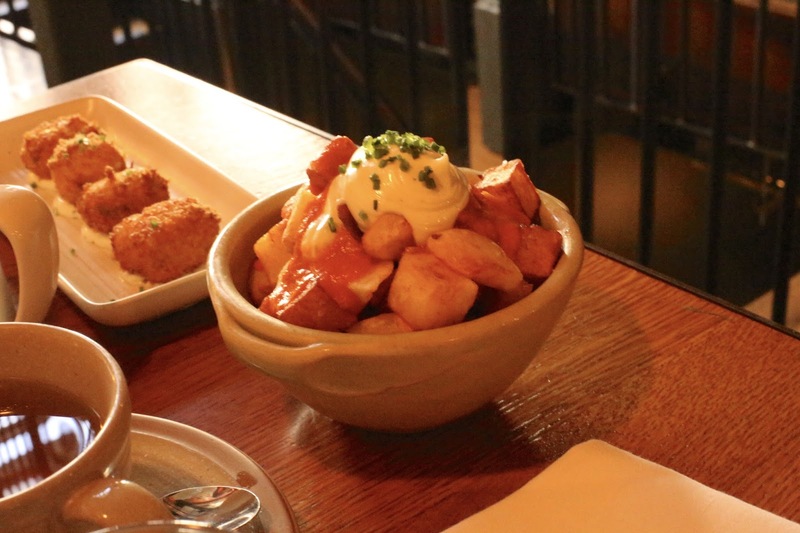 In true me style, I couldn't not order some tapas from the normal menu to accompany our brunch dishes; patatas bravas and croquettes of course. When the normal menu is so good, it's hard to resist. The highlight? The black beans on toast. I've never tasted anything so delicious. I'm a traditional kinda brunch gal but give me Spanish food and I'm forever yours. It's a nice quirky twist on brunch if you're bored of the standard avo on toast. We also went for the full Spanish breakfast, with chorizo sausages, a hens egg (which was cooked to perfection) and more. Probably the best fry up I've had. Me savouring every mouthful of the beans, beans on toast, Spanish style - definitely heaven. I drank all the green tea, all the fresh juices (delicious), the fresca juices are worth a try as they're fresh and delicious, then it was ready to head home and soak up the sunshine. On a hot Summers day, I love nothing more than a suede skirt (similar here, here, here and here) and a pretty loose top (online here). Now for the grand finale, inspired by my love for gin, Alexander and James kindly sent me the loveliest set so I can enjoy Tanqueray 10 in my own home. It's safe to say I am in love with these beautiful glasses which came in the gin gift set. I want to savour them for when I get my house next year. But after a delicious day, it would be rude not to. These photos really don't show just how amazing Pintura is, it's such a dark venue so taking photos (even with my new, incred camera) is just impossible - but seriously, it's an amazing place and I feel sad that my photos don't portray properly. You need to be there to understand how lovely it is. Pintura, you always make my belly so happy and the gin bar really inspires me to up my drinking good quality gin game! Alexander and James made that possible! Thanks for the loveliest gift to top off the loveliest weekend! If you're looking for good places to eat in Leeds, make sure you read my top places to eat and drink in Leeds post - it's an underrated fabulous city! Do you love brunch? Do you go for brunch a lot? Do you like Spanish food? Do you love tapas? *I worked with Alexander and James on this but as always, it's my 100% honest opinion.